Shop Online > Workshops & Specialty > Two-O'Clock Alpaca Walk or Anytime By Appointment! Two-O'Clock Alpaca Walk or Anytime By Appointment! Island Alpaca welcomes you to join us for our daily walk with our friendly alpaca. Walking with our alpaca is a way to learn more about how gentle our alpaca truly are! A wonderful experience for all ages. Every participant will learn the basics of handling an alpaca safely as well as where alpaca come from and why they are important to us. One can see how sweet and gentle they are by interacting with them, and literally get your hands on them to see how luxurious, and how soft their fleece is! 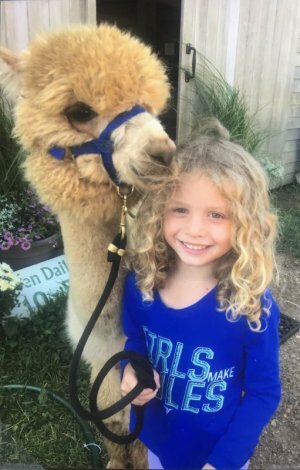 Our Two-O'clock Walk is a fun farm experience for any alpaca lover age 14 or older; (Younger participants welcomed with attending parent/guardian.) One child under the age of 14 per attending parent/guardian). A perfect way for those who are thinking about owning alpaca to learn more about them! Program Time: Join us for an exciting session of Alpaca Walk @ 2-O'Clock is available every day at 2 pm sharp. Rain or Shine! Pre-Registration: Cost is $15 per person for one half-hour long session. Payments may be made by telephone, online, or by check (payable to Island Alpaca Co.) or in person at the farm prior to program day, or by mail. Program size is limited, and all registrations are on a first-come, first-served basis. If a person or parent is accompanying someone participating they would also be considered a participant and must register. SPECIAL NOTE: Online Registrations must be made 24 hours or more, in advance of walk date, as spaces in the program are limited to ensure a quality experience for participants and alpaca alike. We will contact you if space is not available. To confirm space available prior to registering, contact the farm during regular business hours. Walk-ins welcomed on a space-available basis.